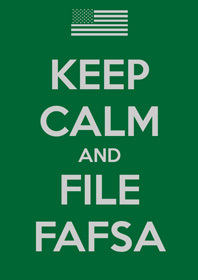 Preparing to fill out the Free Application for Federal Student Aid otherwise known as FAFSA? It’s a daunting task but well worth your time. FAFSA can open the doors to the $150 billion in grants, loans, and work-study funds that the federal government has available. Also, many states, schools, and private scholarships require you to submit the FAFSA before they will consider you for any financial aid. We’ve compiled some resources to help you met the challenge. Ready, set, go! To start, here are the top 5 things you need to know about FAFSA. The FAFSA is available online. If you need a paper copy, you can download a PDF at http://studentaid.ed.gov/resources or call 800-4-FED-AID (433-3243). There are great resources available online to walk you through the process. There are even Web 2.0 resources such as videos that explain the process. Colleges and universities have different deadlines so use this tool to determine when forms are due. You must fill out a new FAFSA each year. The new FAFSA is available on January 1 each year.